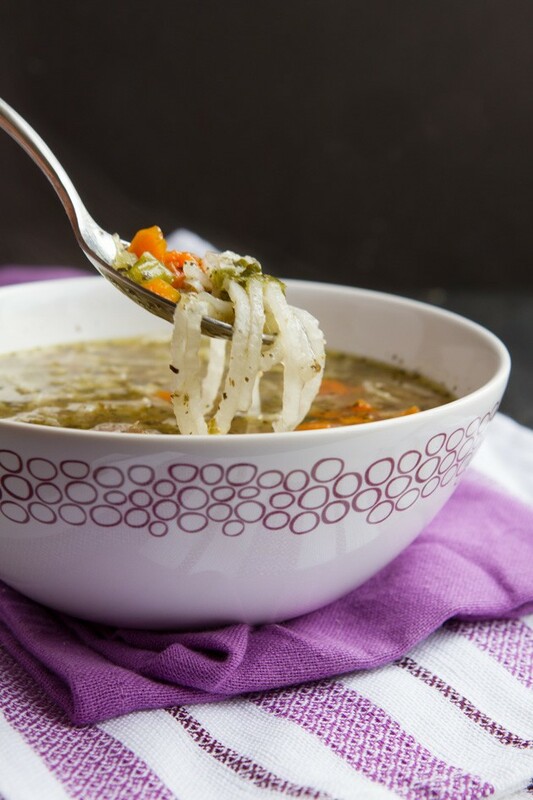 Low-carb chicken noodle soup made with spiralized daikon, chopped carrots, celery and chicken thighs simmered in a rich chicken stock. Ready in just 30 minutes. To make in an Instant Pot: Add coconut oil and chicken thighs to the bowl of your Instant Pot. Set on saute and cook for 10 minutes, until chicken is just about cooked through. Shred with a fork. Add celery, carrots and onions. Cook for another 2 minutes. Add remaining ingredients. Cover and set on “soup” setting for 15 minutes. Once complete, add daikon noodles and serve. To make on a stove top: Add coconut oil and chicken thighs to a large saucepan. Cook on medium for 15 minutes, until chicken is just about cooked through. Shred with a fork. Add celery, carrots and onions. Cook for another 5 minutes. Add remaining ingredients. Cover and bring to a boil. Reduce heat and simmer for 25 minutes. Once complete, add daikon noodles and serve. Celery: If you’re severely FODMAP sensitive, you can replace the celery with more carrots, or use radishes! 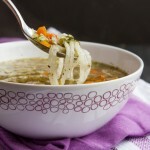 Daikon Noodles: You can find daikon in your local grocery store. I was able to find some at health food stores, Superstore, and Walmart carried it, too. Best if made into noodles with a spiralizerhttp://amzn.to/1LSBtpB, but a vegetable peeler will work as well.